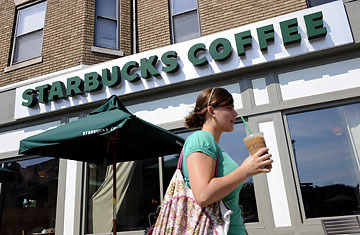 A customer walks past a Starbucks Coffee shop in the Adams Morgan neighborhood of Washington, D.C. In February 2006, Starbucks CEO Howard Schultz was asked on TV if opening 1,300 stores in the US in a single year was "too much too fast." "Not at all," the then-chairman said. "We have been a growth company for the last 20 years. And the hallmark of that growth has been our ability to invest ahead of the growth curve." What a difference two years makes. On July 1, the Seattle coffee behemoth announced that it would close some 600 underperforming stores in the U.S., a move that Schultz called, "the most angst-ridden decision we have made in my more than 25 years with Starbucks." It is a sign that Starbucks, which has 11,434 outlets in the U.S., has hit a wall. The element of truth in countless parodies  like the new Starbucks that opens up in the bathroom of another  has finally caught up to a company that at one time was able to launch five new stores a day and still have lines of customers out the door. Starbucks clearly did build too much too fast, and had the misfortune to do it just as a downturn in the economy and consumer spending made it harder for any retailer to turn a profit. Of the 600 company-owned stores due to close, some 70% were opened since October 2005, and most have another store in close proximity. Starbucks's strategy of cannibalizing its own sales  a store loses about 25% to 30% of its revenue when another outlet opens down the block  works when customers keep streaming in, but once foot traffic slows, as it has over the past year, it is much more difficult to still make money at both stores. Taken as a group, the 600 stores, which are spread across all major markets, aren't profitable. Starbucks's stock, which has fallen more than 50% in the past two years, rallied in early-morning trading. Investors liked the announcement, which replaced an earlier, less-aggressive plan to shutter just 100 shops. "The first step is admitting you have a problem," John Glass, an analyst at Morgan Stanley, wrote in a research note. He estimated that closing the 600 stores could boost U.S. operating margins by at least 1 percentage point. Shutting laggard stores is hardly an unprecedented strategy. When McDonald's was struggling in late 2002 and early 2003, it announced the closure of nearly 700 stores in order to weed out less-profitable operations and focus on improving returns at existing stores. To drive traffic to those stores, the hamburger heavyweight then buckled down on product development, rolling out new offerings like salads. Starbucks is also kicking up its R&D machine, debuting, among other things, smoothie-style drinks later this month. The store closings are a significant slice of Starbucks's operations, representing 8% of company-owned stores in the U.S. and 7% of the firm's global workforce. They account for some 19% of company-owned stores built since October 2005. But more than a third of the Starbucks in the U.S. are run by licensees  you'll find them in airports and on the turnpike  and so far there are no plans to shutter any of those. Nor are there plans to close any international stores, which are a small part of the company's overall profits but its biggest prospect for future growth. And not all U.S. growth has ground to a halt: Starbucks will open between 200 and 250 stores in the U.S. over the next few years in markets where they still aren't meeting demand. Nonetheless, the coffee company has a long haul ahead. Resizing its footprint to better fall in line with demand is a step in the right direction, but hardly a cure-all. Morgan Stanley's Glass points to "deteriorating underlying trends," such as the slowing economy and stepped-up coffee competition from the likes of Dunkin Donuts and McDonald's. Steven Kron, an analyst at Goldman Sachs, pointed out in a research note that while short-term investors may be enthusiastic about store closings, long-term investors still need to know more about how broader business trends play out. He has made no change to 12-month price target. Starbucks still has a lot more work to do to prove that it's righting the ship.